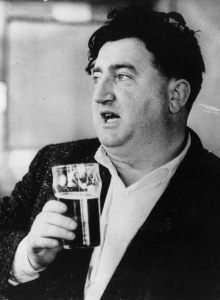 The death of maverick Irish writer, Brendan Behan, (above) 50 years ago, has been much remarked upon. But Behan shares this anniversary year with another major Irish literary figure, playwright Sean O’Casey, who appears as a character in my latest novel, The Rising of Bella Casey, which tells the story of his sister Bella. The bare biographical details of Behan and O’Casey’s lives tell their own story. Behan died aged 41 on March 20, 1964, from alcohol-related diabetes. Six months later, O’Casey passed away aged 84. The age gap between them belies how much they had in common, although their lives did not cross. Behan was certainly influenced by O’Casey’s work, particularly his Dublin trilogy – Shadow of a Gunman, Juno and the Paycock and The Plough and the Stars. Although a Protestant, O’Casey was brought up in straitened circumstances in northside Dublin and combined his literary career with a political radicalism, although he was a late bloomer as a writer. He was in his forties before his first play was staged. Born 43 years after O’Casey in the same neighbourhood, Behan, a Catholic, was a precocious talent. He began writing in his teens contributing to Irish Republican magazines. His work was heavily influenced by his political commitment. In Behan’s case, that commitment included active involvement in the IRA, which resulted in two spells in prison. Borstal Boy – a play based on his novel of the same name is now running at the Gaiety Theatre, Dublin in a new production directed by Conall Morrison – describes Behan’s first sentence in England for IRA activities. The Quare Fella tells of an execution at Mountjoy Jail when Behan was imprisoned there, and The Hostage deals with an IRA kidnapping of a British soldier. Through very different routes, both came to roughly similar conclusions in their writings about the fight for Irish freedom – “that while the issues involved were nationalism and imperialism, the ordinary poor had nothing to gain and a great deal to suffer in the cross-fire” as Colbert Kearney notes in The Writings of Brendan Behan. Conversely, Behan described himself as a drinker with a writing problem. Interesting post – I hadn’t realised that both were form the same area of Dublin. Love Behan’s “…piece of impertinence”!